The University of New Mexico hosts its commencement ceremonies Thursday & Friday, Dec. 10 & 11. Separate ceremonies will be held recognizing graduate degree students and baccalaureate and associate degrees students. The graduate ceremony, set for Thursday, Dec. 10, honor doctoral and master's degree candidates, while the undergraduate ceremony, honoring bachelor’s and associate’s degrees, is Friday, Dec. 11. Both ceremonies begin at 6 p.m. at Wise Pies Arena aka The Pit. In addition to the degrees being conferred, the Presidential Award of Distinction will be awarded to recipients Patricia Crown and C. Jeffrey Brinker will receive recognition from Frank at the Dec. 11 commencement. Brinker and Crown are the fifth and sixth awardees of the award Frank established the award in 2013. 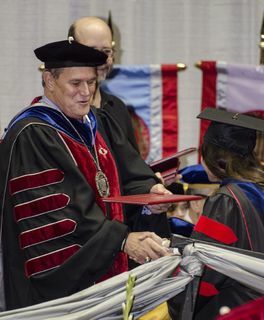 UNM president Robert Frank hands out a diploma and congratulates a graduate at commencement. The speakers for this year’s fall commencement include undergraduate keynote Manuel Montoya, a professor of global structures at the Anderson School of Management. He received his Bachelor of Arts at UNM before pursuing his graduate education at Oxford University and Emory University as a George Woodruff Fellow (Ph.D.). Paul Hommert, former director of Sandia National Laboratories and president of Sandia Corporation, is the keynote for the graduate ceremony. He began his career with Sandia as technical staff in 1976 and gradually moved up. Hommert initially led programs supporting energy research. He retired from Sandia National Laboratories in July 2015. In August of this year, he was named a Distinguished Fellow of the Council on Competitiveness. Approximately 1,944 students are expected to receive degrees this fall. Main campus will award approximately 1,267 bachelor’s degrees, 363 master’s degrees, 61 doctorates, 18 juris doctorates, 4 medical doctorates, 33 graduate certificates and 2 education specialists. At the branches: UNM-Gallup, 68 associate degrees and 20 certificates are projected to be awarded; at Los Alamos, 27 associate degrees; at Taos, 22 associate degrees and 9 certificates; and at Valencia, 47 associate degrees and 3 certificates. Convocation ceremonies are celebrations hosted by individual schools, colleges and/or departments just for their graduates. For specific dates and locations, visit Convocation ceremonies. For all related information, visit Fall 2015 Commencement.